Millions of children are currently living in exile, having had to flee their homes due to armed conflict, widespread violence or natural disaster. Many get separated from their friends and family and are left without the care and protection they need – which means they’re at risk of abuse, exploitation and recruitment into armed groups. Whilst many international aid agencies are on the ground providing food and shelter, access to education remains limited, and funds are urgently needed to deliver educational activities to children in their temporary homes. Trust in Children has decided to prioritise making grants to initiatives delivering educational activities to displaced children in 2016. Education contributes to long-term solutions for refugees, ensuring that displaced generations are equipped to rebuild their lives and communities – either in their country of sanctuary or upon their return home. It can also give children in refugee camps much-needed development and therapeutic support so that they can continue to grow and learn despite the difficulties of living in temporary settlements. Please help us to support displaced children this year by making a donation. In some developing communities, education is far from free, and children are sent to work on the streets instead of going to school. 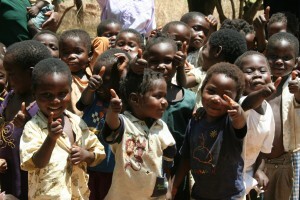 But just £5 will buy the books and uniform, and pay the fees, for a child to go to school for a month. There are two ways to make a one-off donation to Trust in Children.